Vaccines: What do you really know about them? The whole vaccine topic has become very heated recently. I have been asked by several friends to share links, sources, and information concerning vaccines. I have been very hesitant, but with states starting to propose new laws to take away parent’s rights I cannot remain silent. No matter what your opinion is on this subject- you need to know the impact of losing your rights as parents to make medical decisions for your children. This begins a series to share some of the information I have learned over the past several months. It is not to change anyone into a pro or anti-vaxer. My goal is to empower other parents to do their own research to truly make an informed decision no matter what you decide for your family. How much do you really know about vaccines? Stop and really think about this question. Is this the information you know? 1. Vaccines are safe and effective. 2. Vaccines are the medical establishments greatest contribution to public health in the past century. 3. Vaccines save millions of lives every year. 4. Vaccines do not cause autism. 5. Children who are not vaccinated spread diseases and are a public health threat. 6. People who do not vaccinate are harming our herd immunity. 7. Measles is a deadly disease. If the statements above are the only information you know about vaccines: You really do not know much about them. I am not saying there isn’t any truth in those statements, but they are far from the whole story. I don’t mean to hurt feelings or upset you, but you need to know there is more to this vaccine debate. There are always two sides to a story and one of them is not being shared on the news. If you really want to understand vaccines you must turn off your television. To be fair- I did not know anything about vaccines several months ago. I was like most of you. My husband and I were both vaccinated as children. I had never researched anything vaccine related. I spent more time during my pregnancy looking up reviews on baby monitors, bathtubs, and how to get a baby to sleep. And that is what we do. 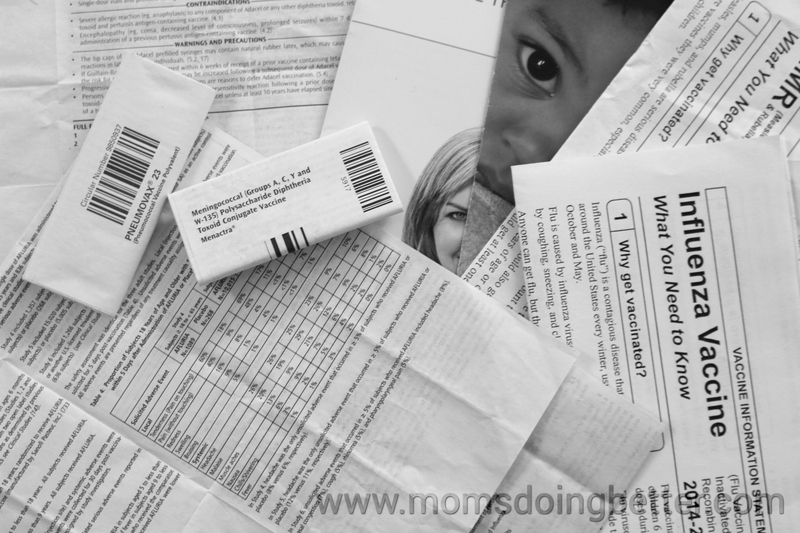 We spend so much time registering for baby items, making our birth plan, and going to birth classes. But do we even look into the vaccines that are given to our children within the first 24 hours of life or their first year? Why do we not even question them? When I was pregnant, I went to a seminar on vaccines hosted by a local doctor. I knew that I wanted to know more before we made any decisions. I had learned over the past ten years to question everything when it came to medical treatment except in emergency situations. During the beginning of the seminar, the doctor repeatedly asked if anyone had any guns. I kept thinking how odd that was. Why would he be asking if anyone had brought any guns? Since then I have learned why he would be scared someone would be against what he was saying. You don’t ask questions about vaccines. The seminar covered real data. He crunched numbers, showed graphs, and explained certain diseases. He also demonstrated how easy it was to skew data. Fast forward to today. I have spent the past few months every single day going through the data, reading the studies, and listening to seminars. I wanted to hear from both sides. I wanted to know why more and more people are choosing to not vaccinate or at least delaying vaccines. I wanted to read the ‘science’ behind vaccines and to learn the history. I wanted to hear the stories of vaccine injured children. I am thankful to have come into this debate neutral. I wasn’t against nor was I adamantly for vaccines when I started researching them. I wanted to make an informed decision that was best for our family. For those of you wondering about what does research means to me. It means peer reviewed studies in academic journals, systematic reviews, and meta-analysis. It means listening to immunologists, doctors, neurosurgeons, and epidemiologists. It means reading books that have been well cited by professionals in the medical field. If I read a blog- I am going directly to their sources. It means reading the actual package inserts and side effects from the drug companies. It also means learning about the diseases and treatments. And it means learning about the companies that make vaccines. I’ve learned more about vaccines than I ever wanted to know and I am going to share a lot of the important information that I found to empower you hopefully to research yourself. I am also going to share how to get involved to stay up-to-date with your state’s regulations concerning vaccines. Don’t ever take what I have to say or anyone else for that matter as absolute truth- question everything- look into it yourself. You know what is best for your family. And at the end of the day, we are each trying to make the right decision because we care about our children deeply. No matter your opinion on vaccines we can all agree on that. Thank you, Whitney. You have a very sane approach!